Due to your AMAZING generosity, I have far surpassed my original goal of raising $1,000 for the Susan G. Komen Foundation Race for the Cure. 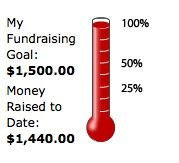 I set a new mark — $1,500 — and I have only $60 to go until I meet that! So if you have been hemming and hawing about donating, or if you thought about spending money on something foolish, like cocaine, Ringling Bros. Circus (it’s terrible now, your kids will have more fun at the park), “surefire” stocks, The Product That Will Finally Make Your Hair Perfect, holiday-themed dinnerware, an empire-waist tunic from TJ Maxx that is on sale but will only be hip until 10 minutes ago, or Bio Bags, please, consider donating instead to this cause. It’s so easy and you can feel rigteous and smug at tax time! You can click away here: www.ockomen.org/race/vmcgrady. Lucy and I will be walking on Sept. 28. I think it’s 100 miles or something. We’ll bring enough water and snacks. Thanks again, to everyone who gave. Your generosity floors me.